Here's a final update on Drax before I start painting. 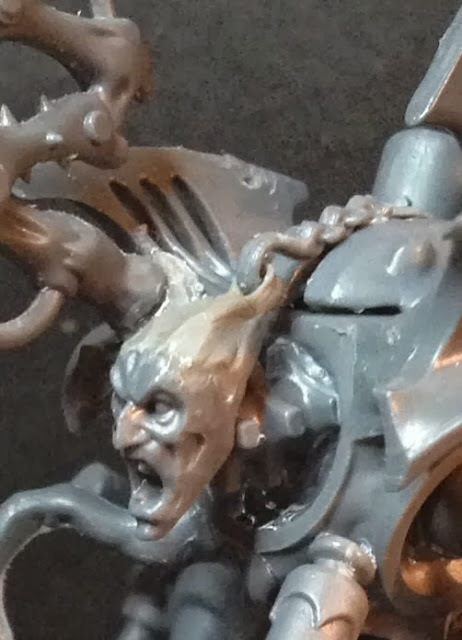 I actually tried some sculpting on this one - trying to make the face seem like a streched skin mask, held in place by a meat hook anchored to his carapace. Very Clive Barkery - as befits a haemonculus. I think it's very effective. Did you wait for it to set a little then stretch it? It'll look great with an equally stretched paint job! Very nice work there, and I can see how you could enhance the effect further with the paint job. Done no if it looks like he has been to the chopshop or he is the chopshop - does look mighty nasty either way, great job.